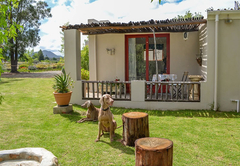 Kuruma Farm Cottages is a highly recommended B&B with self catering option, providing accommodation in Worcester for tourists visiting the Breede River Valley region. 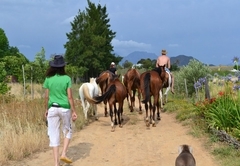 Kuruma farm cottages are located and managed by the proprietor and host, Celeste Scholtz Burger. Celeste and her team will make sure your stay is comfortable and seamless, looking after all your accommodation needs. Kuruma lies nestled amongst the vineyards in the beautiful Brandwacht Valley at the foot of the majestic Brandwacht Mountains. 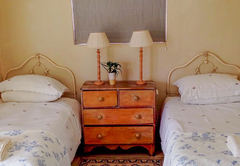 We offer charming and stylish accommodation which is ideal for a family weekend getaway or a business person who would like to wake up in the countryside, yet only 10 minutes away form an appointment. 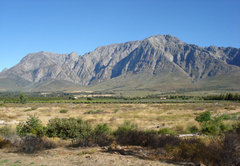 Kuruma is 7km from Worcester and 1hour 15min from Cape Town. 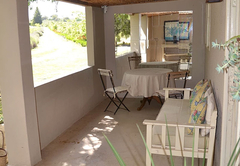 It is ideally situated for the exploration of the Breede River Valley and Route 62 or for business travelers to Worcester. 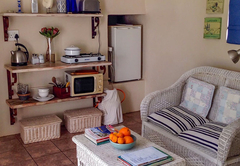 Accommodation consists of four comfortable and tastefully decorated cottages (2 cottages with two bedrooms and lounge/kitchenette and 2 smaller cottages with one bedroom and lounge / kitchenette), all with en suite bathrooms. 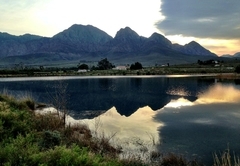 The cottages are situated about 500m away from the main house with breathtaking views of the mountain. 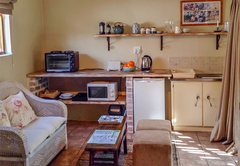 All cottages have satellite television and wireless internet. Sleeps 3/4. This is a prefab cottage with a covered verandah. 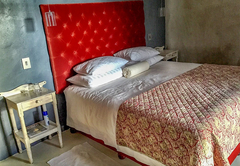 There are 2 bedrooms, one with a queen size bed and one with a ¾ bed with one bathroom and a lounge/kitchenette to share. Sleeps 4. 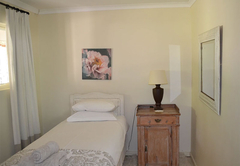 A queen size bedroom with en suite shower, two single beds with en suite shower and a lounge/kitchenette. 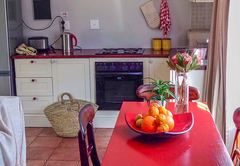 Sleeps 2 This is a small cottage with 2 single beds and a shower en suite and a small kitchenette/ breakfast room and a north facing veranda. 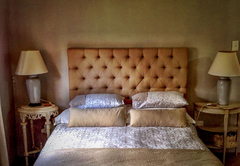 Sleeps 2 Double bed with a shower en suite and a small kitchen/breakfast room and a north facing veranda. 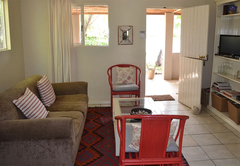 All the cottages have satellite television and wireless internet. 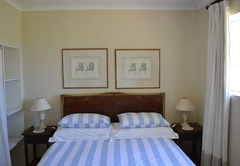 All the bed linen is cotton percale and all cottages have a heater and fan. 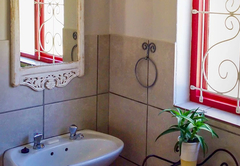 Cottages can be rented as self-catering or Bed and Breakfast. 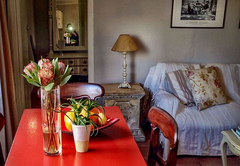 Breakfast is then served at the main house on the covered verandah from 07h00 to 10h00. Alternately a continental breakfast basket can be ordered. Fresh wood-fire baked bread can be ordered from the well known baker Trevor Daly. • Volleyball nets next to the cottage. 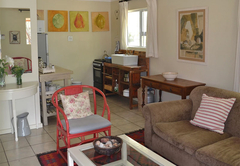 This is a semi-detached small studio-type cottage with a queen size bed, en-suite bathroom and kitchenette. This cottage sleeps 3 persons. 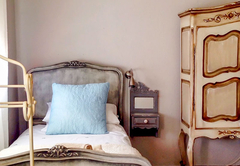 There are two bedrooms, one with a queen size bed and one with a Â¾ bed with one bathroom to share. It has a lounge/kitchenette with a fridge/freezer, gas stove, and microwave and is equipped with the basic kitchenware. 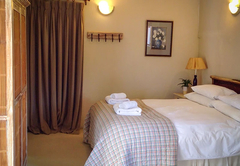 A king size bedroom with an en-suite bathroom (shower only). The lounge and kitchen area is North-facing with spectacular views of the Audensberg Mountains. The bunk bed in the lounge can be used if need be for children (max 2). Equipped kitchen. The Cottages at the bottom of the farm where we stayed (Angelica), Lavender, Neroli) were simple but comfortable. It was nice having all 3 to ensure we could maximise. Nigella was very special. 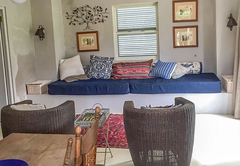 It is has great space and great views and is very tastefully decorated. All in all we loved the views and the quietness and will definitely go back!! Response timeKuruma Farm Cottages typically responds to requests in 5-10 minutes.